Progressively enhances the search form on a website. Modules that have more to do with assisting development of a site rather than managing its content. Markup modules that are called upon to generate or parse markup (like HTML). Markup modules are most often used on the front-end of a site (rather than admin). This module progressively enhances the search form to an ajax live search. It will perform a search like you would use the form normally, and returns the output of the search page. So the search will still work without js enabled.There's some basic styling attached to this module in the "styling-example". You can use it to get started. See readme in there. added support to turn off automatic script injection. See Module Setting section for further information. added key support for browsing results with arrow down and up. added escape key to close results. 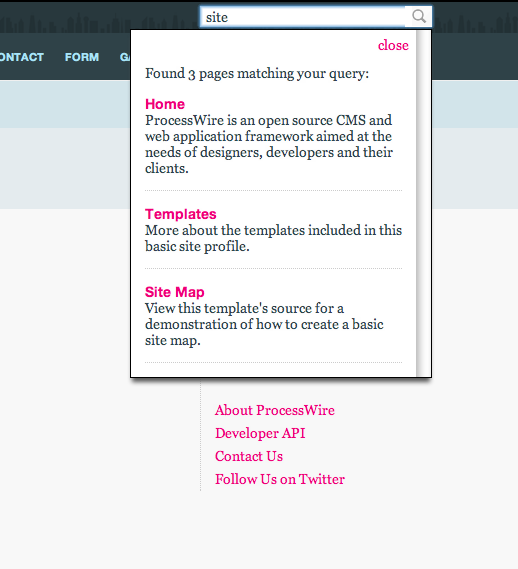 So it works almost out of the box with the basic install profile of ProcessWire, you only need make a minor change to the search.php template file to only return the content part (results) on a ajax request. It comes with some module options to define various settings regarding the search form. Login to processwire and got to Modules page and click "Check for new modules". You should see a note that AjaxSearch module wes found. Install the module. Does it work with PW 3.X ?